Fringed bleeding hearts, while not the showiest of perennials in their genus are valued by gardeners who appreciate delicacy in a plant. Find out all about these plants, including their native origin. Learn about growing them, caring for them, and using them to best effect in the landscape. Fringed bleeding heart plants are herbaceous perennials. These flowers belong to the poppy family, being classified in plant taxonomy as Dicentra eximia. Whoever named these plants thought very highly of them, as the species name of eximia means "distinguished" in Latin. When the Romans were preparing to sacrifice a cow and found a "choice" victim, that animal was called eximia. Fringed bleeding heart plants reach a height of 12 to 18 inches with a similar spread. In addition to their romantically-shaped flowers, which first come out in spring, these perennials are valued for their grey-green, deeply dissected leaves. They bear several drooping flowers along a leafless stem. The flower color is most commonly pink or reddish purple. Alba is a white-blooming cultivar of this wildflower. Indigenous to eastern North America, Dicentra eximia can be grown in planting zones 3 to 9. You can grow this plant in full shade to partial shade, but plants located in full shade will not bear as many flowers. Dicentra eximia grows best in moist but well-drained ground. Furnish this perennial with a liberal dose of compost for optimal growth. The fact that fringed bleeding heart plants are sometimes found in rocky soils in their native habitat suggests usage in rock gardens. However, they are not as tolerant of dry conditions as many perennials used in the rockery. Shade-loving and capable of naturalizing, they are also an obvious choice for woodland gardens and shade gardens. They can spread both by reseeding and via rhizomes. Fringed bleeding hearts attract hummingbirds. Since they are poisonous plants if eaten, it is not surprising that they are also deer-resistant plants. Growing such deer-resistant perennials is a great way to cut down on landscape maintenance. Divide these perennials in spring, every few years, to ensure vitality. Apply mulch to minimize competition from weeds. Deadhead to promote reblooming. The fringed, fern-like appearance of the foliage is the reason that some gardeners prefer Dicentra eximia to the showier and more widely grown bleeding hearts, D. spectabilis. The leaves are not only more attractive but also last through the summer heat, unlike those of D. spectabilis. Dutchman's breeches plant (Dicentra cucullaria) bears white flowers on leafless stems that truly do remind one of the pairs of pants hung out to dry on a clothesline. The fern-like foliage dies back in summer, but the plant lives on, underground, in a state of dormancy. Squirrel corn (D. canadensis), like Dutchman's breeches, has white flowers, but the flowers assume a shape more like those on Dicentra eximia and D. spectabilis than those on D. cucullaria. It, too, has leaves that remind you of ferns and that disappear in the heat of the summer; both are suited to zones 3 to 7. Pacific bleeding heart (D. formosa) has pink flowers and leaves that are bluish-green and shaped like ferns. The Latin word, formosa, translates to "beautiful." It can be grown in zones 4 to 8. Native to the West Coast of North America, it is the West's version of the fringed bleeding heart. For something quite different in the same genus, try D. scandens. It is a large vine (10 feet tall) with yellow flowers. But it is not as tolerant of the cold as are other types of Dicentra: It is hardy only in zones 7 to 9. 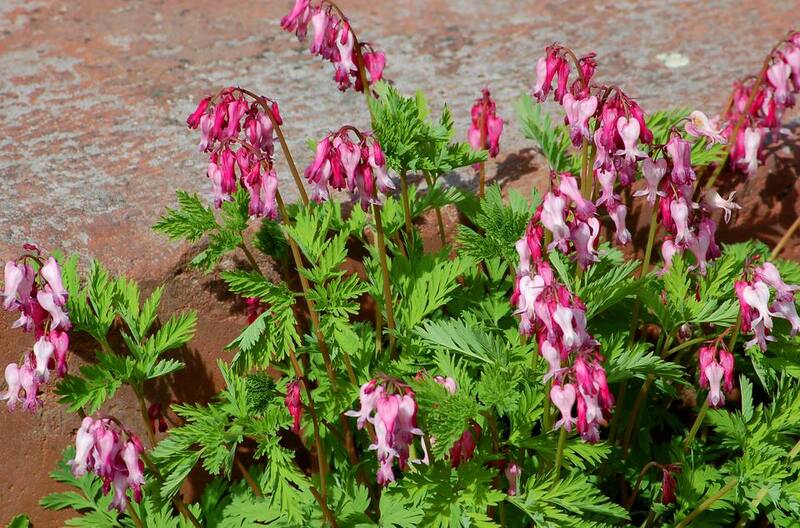 Some types of false bleeding heart (Corydalis spp.) have fern-like leaves, including C. cheilanthifolia, its cultivar, Manchu, and C. lutea (all have yellow flowers and grow in zones 3 to 6). Since C. lutea is by far the most popular Corydalis, it is the type that you are most likely to find in garden centers. C. lutea Alba bears white blooms. If you can find it for sale, of even greater interest will be C. flexuosa China Blue (zones 5 to 7), so called because it produces blue flowers.